Former Eastern Samar Governor Lutgardo Barbo on Wednesday filed a disqualification case with the Commission on Elections against incumbent Eastern Samar Rep. Ben Evardone, who is running for governor of the province, and a cancellation of accreditation as party-list group against An Waray over its alleged violation of the Omnibus Election Code. 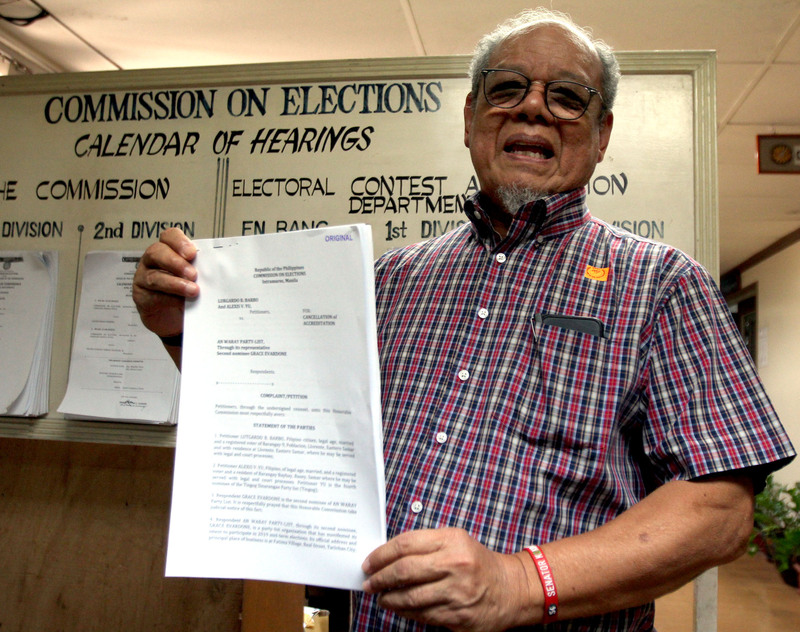 Barbo, the vice president for Visayas region of ruling party PDP-Laban, and Tingog Sinirangan party-list nominee Alexis Yu filed their 10-page petition at the Comelec headquarters in Intramuros, Manila. They alleged that Evardone and An Waray had engaged in election-related offenses during the senior high school graduation ceremony at the Eastern Samar State University-Guiuan campus last April 2. Evardone’s wife, Grace Evardone, is the second nominee of An Waray party-list. Despite earlier guidelines prohibiting political candidates from being invited to graduation ceremonies, Barbo said Evardone was allowed to address the audience, and a video presentation highlighting his accomplishments was allegedly shown during the distribution of diplomas. “We filed this case because the future of our country is at stake here. These so-called leaders don’t deserve to be elected because not only they are morally bankrupt, but they are also brazen in violating the election laws even in the presence of the students and faculty members. My conscience will not allow this,” said Barbo, also a former president of the Philippine Normal University. “Filing this case against Evardone and An Waray is the right thing to do," added Yu of Tingog. "We will hold them accountable for the violations they have committed. People who have shameless disregard for law do not deserve to be in public office. This will also serve as a lesson to the youth and to the public that no one is above the law,” he added. Barbo and Yu said they have gathered sufficient evidence and testimonies from different witnesses at the ESSU-Guiuan campus, which led them to file the charges. In the petition, Barbo said that Evardone violated Sections 104 and 261 (a) of the Omnibus Election Code when he allegedly distributed white envelopes, each prominently marked with the name of Evardone and an Waray party-list, containing P200 to the students after the graduation rites. or withhold his vote in the election, or to vote for or against any aspirant for the nomination or choice of a candidate in a convention or similar selection process of a political party. Barbo also said An Waray violated Sections 6 of the “The Party-List System Act,” or Republic Act No. 7941.